Juicy frozen fruit turns healthy overnight oats into a sweet breakfast parfait -- like eating a sundae for breakfast! I'm on a roll with new breakfast ideas. And I'm continuing with the easy / make-ahead / grab-and-go theme because ... well ... because I'm most decidedly not a morning person. 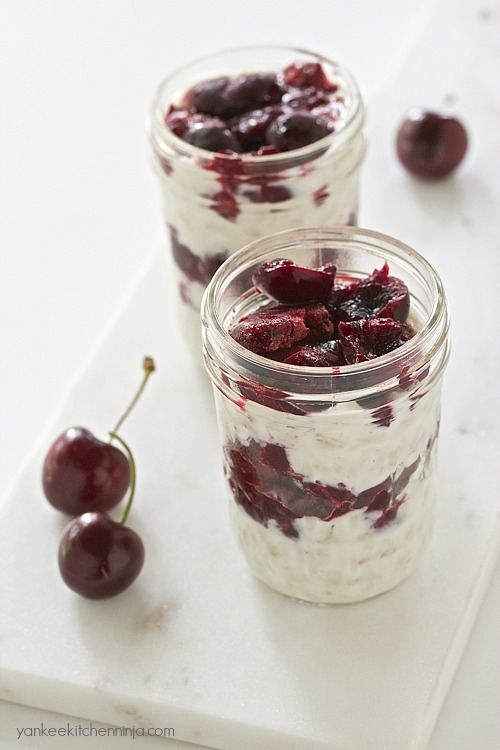 And I'm continuing the whole-grain thing from last week's fruit and grain energy bars with these super-easy overnight oat and yogurt parfaits. Oats are just so darned convenient and versatile, aren't they? I mean, how many other ingredients can claim such yummy success whether they're whole, ground, wet, dry, stewed, baked, boiled or raw? Not to mention all the good-for-you protein they contain. 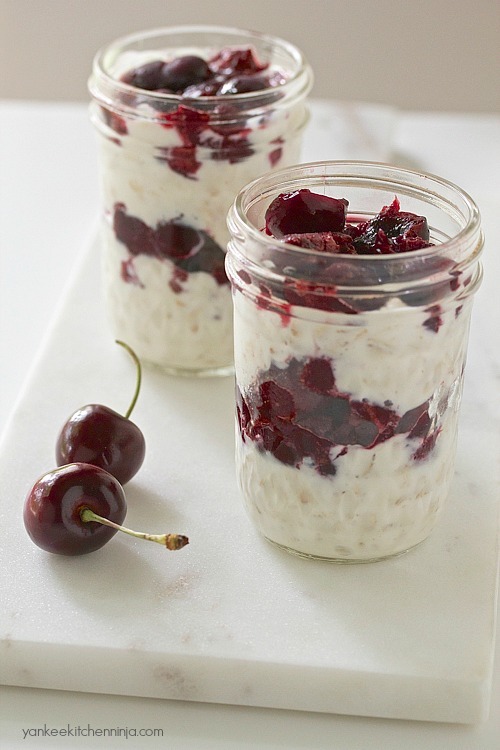 Now, if you read lots of food blogs or waste a lot of time on frequently browse Pinterest, you know that overnight refrigerator oats are pretty much all over the place. Confession time: I tried making them a couple of years ago and HATED them. I couldn't find the right combination of ingredients. Most were too thick or just too blah-tasting. But then I got turned on to the secret of using frozen rather than fresh fruit! You would think I would have figured this out earlier since frozen fruit is also key to my favorite and easiest breakfast smoothie. Duh. I love these oat and yogurt parfaits because the oats don't get overly chewy and the whole mixture doesn't get too thick but instead maintains more of a yogurt-y, kefir-y texture. Best of all, the frozen fruit thaws while the jars sit in the refrigerator and releases all its sweet juice as the oats soften, absorbing the moisture from the yogurt and milk. The whole thing just ends up tasting like a sundae, I swear. And who the heck would turn up her nose at eating a good-for-you sundae for breakfast?!! Not The Ninj (or Mr. Ninj), that's for sure. Another bonus? 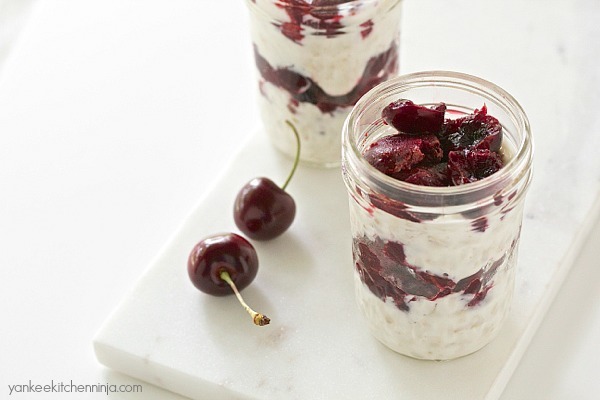 This one simple recipe yields two 8-ounce servings of oat and yogurt parfait (half-pint canning jars are perfect for this), so you can get two breakfasts out of only a few minutes of prep. One more bonus? The parfaits can be kept in the fridge for 2-3 days (not simply overnight), so you can really get a jump on prepping your breakfasts multiple days in advance. I'm all about prepping and multitasking to keep things simple in the morning. How about you? Are you already on the overnight oats bandwagon? Do you have any tips or tricks for your oat creations? Leave a comment: The Ninj wants to know. In a small bowl, combine the yogurt, oats, milk and honey (if using) and blend together well. Divide half of the yogurt mixture equally between two 8-ounce canning jars. Top the yogurt mixture with 1/2 cup of the fruit, again divided evenly between the two jars. Repeat with the remaining yogurt mixture and fruit. Cover and refrigerate at least 6 hours (overnight is best). Can be stored in the refrigerator for 2-3 days before eating. Love the idea. You know how much of a breakfast fan I am ! And a big fan of the overnight breakfast prep, too, I hear. ENJOY!! !